A harmonica can seem like a small, mysterious box — you breathe through it and music comes out. Knowing what goes on inside that little box can help you understand how to play it. Here’s a brief tour of the hidden workings of the harmonica. A harmonica has five layers. The center layer of the harmonica sandwich is a slab of wood, metal, or plastic called the comb. Ten channels are cut into the slab. These channels form the holes that direct air from your mouth to the notes in the harmonica. The comb gets its name because the dividers between the channels look like the teeth of a comb. The layers above and below the comb are the two reedplates, which are stiff plates of brass that enclose the top and bottom of each channel in the comb. Ten reeds are mounted on each reedplate, and the reeds vibrate to sound the notes. 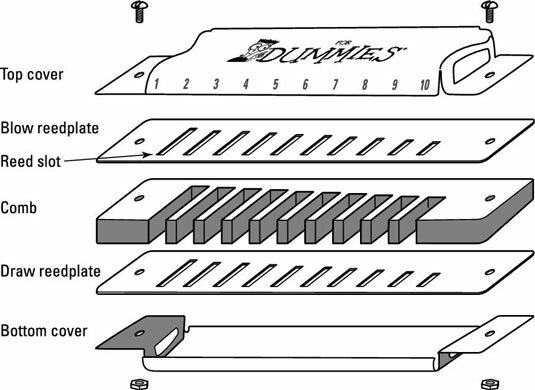 The covers (or coverplates) form the top and bottom layers of the harmonica sandwich. The covers help project the harp’s sound to the listener. The covers also protect the reeds and allow you to hold the harp without interfering with the reeds. The covers are made of thin, shiny metal that reminds people of tin cans. Actually, though, the covers are either stainless steel or brass-plated in chrome or nickel. Each note in a harmonica is sounded by a reed, a thin strip of brass that vibrates when you breathe into the harp. One end of the reed is fastened to the reedplate with a rivet or screw, or by spot-welding. The rest of the reed is free to vibrate. A slot is cut into the reedplate directly under the reed. This slot allows air to get through to the reed and gives the reed a space to swing up and down as it vibrates. Each reed sticks up slightly from the reedplate. Your breath drives the reed into its slot, and then the reed springs back. This cycle is considered one complete vibration. Each note you hear is a reed vibrating hundreds or even thousands of times per second in response to your breath. Each hole has a blow reed and a draw reed mounted in its air channel. The blow reeds are mounted inside the air channels in the harmonica, on the upper reedplate. Exhaled breath pushes blow reeds into their slots and sets them vibrating. The draw reeds, on the other hand, are mounted on the outside of the air channels, on the lower reedplate. When you inhale, your breath pulls draw reeds into their slots to make them vibrate. The pitch of the reed (how low or high the note is) is determined by how fast the reed vibrates. For instance, a long reed vibrates slowly and plays a low note. And if you add extra weight to the tip of the reed, it vibrates even more slowly and plays a lower note. A short reed vibrates quickly and plays a high note. If you look at the reeds on a reedplate, you can see that they progress from long (low notes) to short (high notes) as you go from left to right. Ten-hole diatonic harmonicas are like hotel chains. No matter which one you go to, they’re all organized the same way so you know what to expect and where to find everything. For example, on a C-harp, C is the home note, and it’s always the blow note in Hole 4. The next note up in the scale is the draw note in the same hole (which happens to be D). Similarly, on an F-harp, F is the home note, and you’ll find it in — you guessed it — Blow 4. The draw note in Hole 4 is the next note in the scale (which, in the key of F, happens to be G). This consistency of organization is what makes switching harps easy. Here’s the note layout for a C-harp. It shows all ten holes, with each hole number above the corresponding hole. In each hole, there’s one note name above another note name. The upper note name is the draw note, and the lower note name is the blow note.